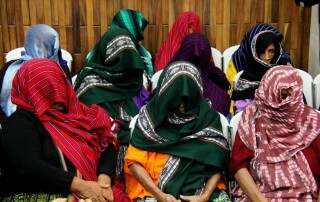 Women survivors of sexual slavery from Sepur Zarco perform a ceremony in honor of the 1-year anniversary of the historic sentence that convicted former members of the Guatemalan military, acknowledging the long fight ahead for reparations. 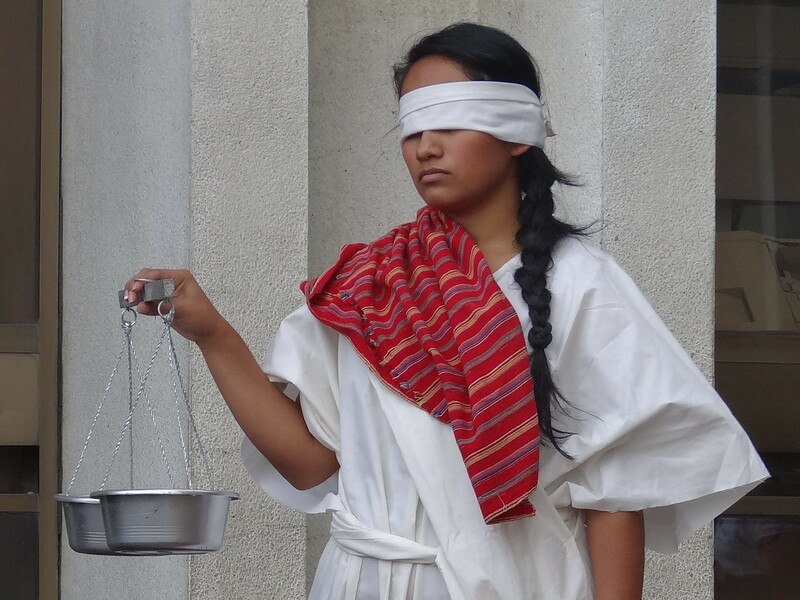 A Guatemalan woman performs outside of the courts during the 2013 trial against former dictator Efraín Ríos Montt for genocide against the Ixil people. 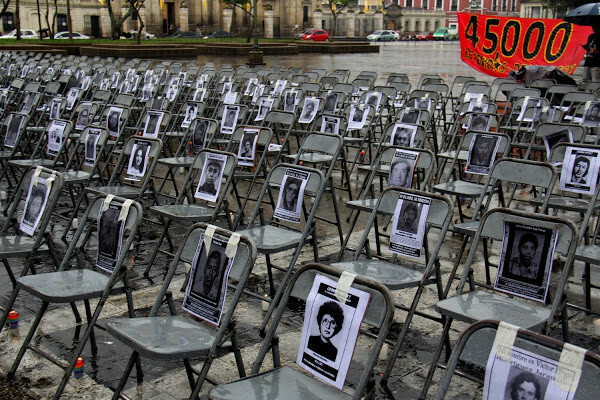 450 chairs are set up in Guatemala City's central square on June 30, 2017, to honor the 45,000 people forcibly disappeared by the military during the armed conflict. Photo: CPR Urbana. 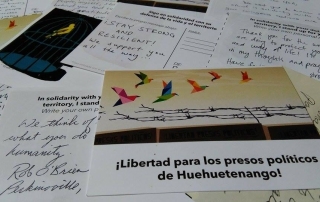 Our Justice & Accountability program provides important information to our grassroots network on groundbreaking human rights cases and the ongoing struggle to end impunity for crimes against humanity and genocide. 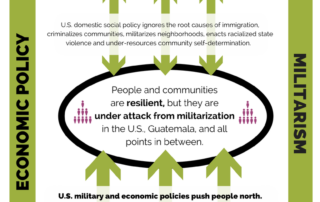 We provide strategic analysis to our network, framing present-day struggles in Guatemala within a context of historic and ongoing U.S. imperialism. 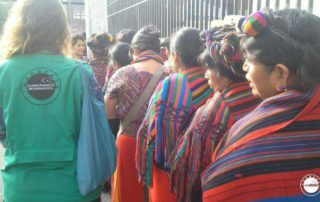 Through ACOGUATE we respond to survivors’ calls for physical accompaniment and advocacy support as they pursue legal cases, historical memory processes, and community healing. Since the singing of the Peace Accords in 1996, Guatemalan individuals and organizations have courageously sought justice. The U.S. government provided financial support and training to the Guatemalan military, responsible for the egregious human rights violations that occurred during 36 years of Internal Armed Conflict. According to the UN Historical Clarification Commission, over 200,000 people were killed and an additional 45,000 forcibly disappeared by state forces. With creativity and bravery, survivors work daily to defend and restore collective memory of the genocide. They aim to guarantee that genocide is never repeated, while taking on the unfinished liberatory work of those who were taken by state violence. Survivors sought justice against Efraín Ríos Montt and José Mauricio Rodríguez Sánchez for crimes against humanity and genocide. Former military officers on trial for crimes against humanity related to the 1982 massacre in Las Dos Erres, Petén. Survivors of sexual violence and sexual and domestic slavery successfully prosecuted former officials for the first time in history. 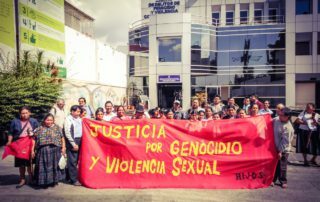 Felipe Cusanero Coj convicted for the forced disappearance of six people between 1982-1984 in Choatalúm, Chimaltenango. Former members of the Civil Defense Patrols in Plan de Sánchez convicted for crimes against humanity. Former members of the Guatemala military on trial for forced disappearance in the largest case in Latin American history. 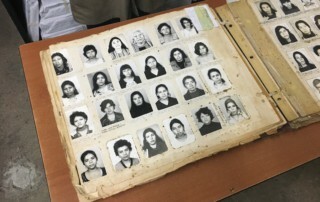 Charges against former police commissioners for forced disappearance in Guatemala City during the Internal Armed Conflict. A list of other important cases that we actively accompany. 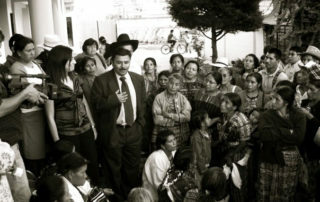 On January 31, 1980, campesino groups from northern Quiché and members of the student group Frente Estudiantil Robin Garcia (FERG) took over the Spanish Embassy to denounce the massacres that were being carried out by the Guatemalan military against indigenous communities in the highlands. At the time, the occupation of embassies was a well-known and effective strategy that was used to call national and international attention to particularly serious human rights violations. 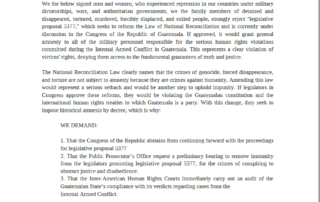 The groups had come to Guatemala City in the hopes of meeting with news outlets, Congress, and the Organization of the American States (OAS), to no avail; no one was willing to publish their testimonies of severe violence at the hands of the military. Despite other successful and peaceful embassy takeovers that called much-needed international attention to Guatemala, the police responded to this takeover with extreme force. Acting on orders that no one get out alive, police set fire to the embassy with flamethrowers. Of the nearly 40 people inside, only two – Spanish Ambassador Máximo Cajal and a campesino man Gregorio Yujá – would survive the initial attack. A day later, Yujá was taken by force from the hospital bed where he was recovering from the serious injuries sustained in the fire. His body, showing signs of torture, was dumped a day later in front of the University of San Carlos. That same day, thousands of university students held a memorial for the victims at the Paraninfo. Leaving the memorial, two student leaders were killed by agents with the infamous Commando Seis – a wing of the now defunct National Police responsible for forced disappearances, torture, and other crimes against humanity carried out in Guatemala City during the armed conflict, under the command at the time of Pedro García Arredondo. Another student was disappeared by the National Police during a funeral procession for the Spanish Embassy victims. On January 19, 2015 – 35 years after the fire – former Police Chief Pedro García Arredondo was convicted of murder and crimes against humanity and sentenced to 40 years in prison. He was also convicted for the murder of the two students killed outside the Paraninfo and sentenced to an additional 50 years. This verdict adds to the 70-year sentence he was already serving for his role in the 1981 forced disappearance of student leader Édgar Sáenz Calito. 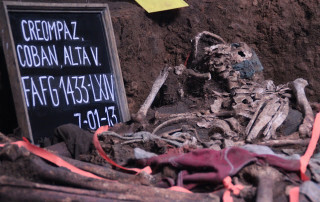 Notably, other high-ranking officials – now deceased – were named in connection to the case, including former President Romeo Lucas García and former General Director of the National Police Colonel Germán Chupina Barahona. The former Interior Minister Donaldo Álvarez Ruiz is also implicated in the case. His whereabouts are currently unknown. 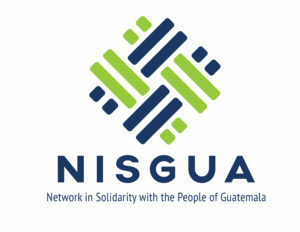 NISGUA, through ACOGUATE, provided accompaniment to the plaintiffs in the case – the Rigoberta Menchú Foundation – before, during, and after the trial. 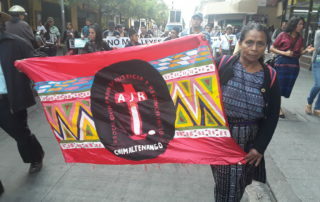 On October 19, 1981, the Guatemalan army entered the community of El Jute, Chiquimula and forcibly disappeared eight people – Jacobo Crisóstomo Cheguén, Miguel Angel Cheguén Crisóstomo, Raúl Cheguén, Inocente Gallardo, Antolín Gallardo Rivera, Valentín Gallardo Rivera, Santiago Gallardo Rivera, and Tránsito Rivera. After much organizing by their family members, the public prosecutor’s office opened an investigation in 2005. Later that year, three former military commissioners – Salamón Maldonado, José Domingo Ríos Martínez, and Gabriel Álvarez Ramos – and a former Colonel stationed at the military base in Zacapa, Marco Antonio Sánchez Samayoa – were detained on charges related to the case. While the case was sent to trial in April 2008, the military’s continual efforts to adversely apply the National Reconciliation Law – known as the “Amnesty Law” – prevented arguments from being heard until September 2009. Survivors lived in the same communities as family members of the accused and faced intense threats during the trial. On December 3, 2009, the court convicted the three former military commissioners (one of whom had died during the trial) and former colonel for illegal detention and forced disappearance and sentenced them to more than 53 years in prison each. All subsequent appeals were denied. At the time of the sentence, Colonel Marco Antonio Sánchez Samayoa was the highest-ranking military officer sentenced for crimes against humanity in Guatemala. As part of the sentence, the judges also ordered investigations into others in the military chain of command who may also bear responsibility for the forced disappearances – including former Head of the Army Benedicto Lucas García and former Defense Minister Ángel Aníbal García. The ruling also opened the door for the investigation of a second case, El Jute II, in which other officials and soldiers stationed at the Zacapa military base in 1981 tortured and raped community members. 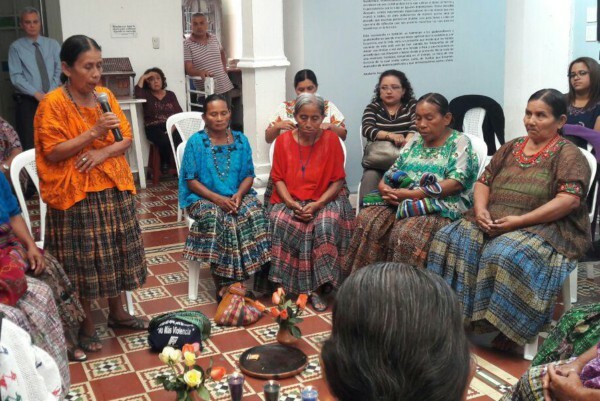 NISGUA, through ACOGUATE, continues to provide international accompaniment to the group of family members who sought justice for these disappearances and continue to work for justice in the El Jute II case. 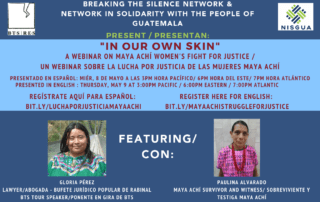 We also provided accompaniment to the Grupo de Apoyo Mutuo (GAM), one of the organizations that supported the survivors in their search for justice. 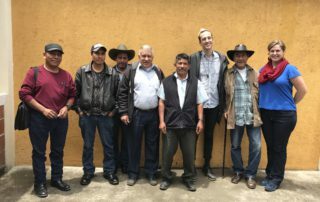 “Guatemala: Forced Disappearance and the Search for Justice in El Jute” – Article published on UpsideDown World by former NISGUA accompanier, Josh McLeod.